As time goes on, researchers are discovering ways to make receiving dental implants easier and more efficient. Considering more and more patients are choosing implants to replace teeth, it’s more important now than ever for implants to take the next step in advancing as a dental technology. It’s estimated that 69 percent of adults between the ages of 35 and 44 will have lost at least one permanent tooth and 26 percent of adults 74 and older will have lost all their teeth. Here are three advances your dentist in Downtown Los Angeles suspects will accompany more dental implant treatments in the future. We already know that dental implants are capable of helping patients keep their natural bone. However, with the help of computer aided design and manufacturing, also known as CAD-CAM technology, dentists will be better equipped to create replicas of non-salvageable teeth. These replicas can be implanted as soon as teeth are extracted, minimizing the rate at which bone can resorb back into the body. Additionally, the healing process for implants becomes closer to symptom-free. By using CAD-CAM technology to create more exact replacement teeth more quickly, dentists can provide patients the best possible treatment in the least amount of time, creating a more efficient dental implant process overall. Many patients are apprehensive about receiving dental implants because they aren’t sure what their smile will look like afterwards. To help patients answer their questions, CAD-CAM technology can make the process of not just receiving dental implants easier, but envisioning what the outcome will look like with more clarity. Digital Smile Dentistry makes use of imaging technology to show patients how implants will change the appearance of their smile. By creating digital images based on in-depth models of patients’ teeth, dentists can remove any doubts people may have about receiving treatment. As long as a dentist makes use of this technology, they’ll be able to prove to patients what their new smile will look like using the most accurate information possible. It’s rare for dental implant treatments to only require an implant dentist. In many cases, oral surgeons, periodontists, lab technicians, and other specialists will provide their expertise as well. 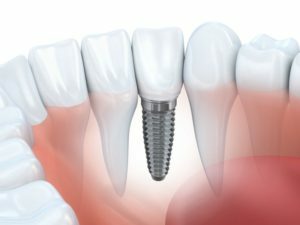 Digital technology like the CAMLOG implant system combines planning software, surgical techniques, and even a guide system to achieve the most ideal implant placement. Essentially, the better your dentist can plan your implantation, the higher the success rate will be for your treatment. Furthermore, technology doesn’t only allow the process to be more accurate. It also increases efficiency and makes for easier collaboration with other dental facilities (i.e. dental fabrication laboratories.) This saves you and the dentist time and money on treatment overall. Have more questions about the future of dental implants in Downtown Los Angeles? Schedule a consultation with your dentist to learn more about the process or get started rebuilding your smile! Dr. Adam Geach earned his DMD degree from the Harvard School of Dental Medicine and his Certificate in Prosthodontics from the University of Connecticut School of Dental Medicine. As a prosthodontist, he specializes in dental esthetics, implants, and reconstructive dentistry. To learn more about his practice, contact him through his website.